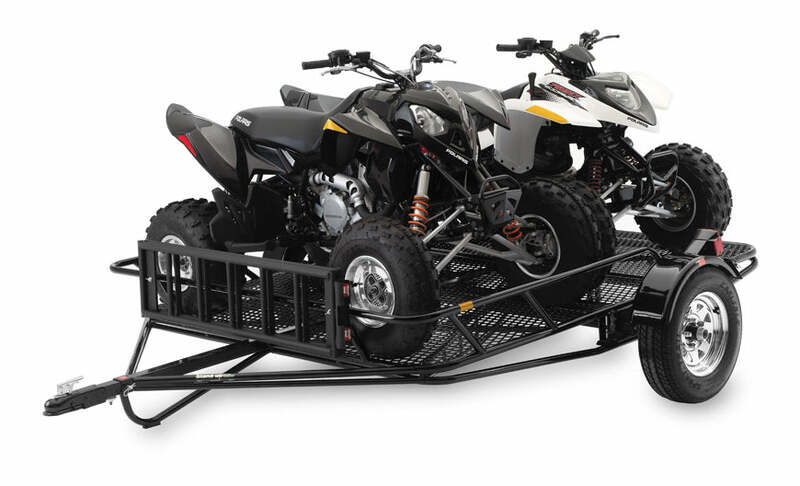 Utility Trailer and Folding ATV Trailer for Off Road Applications (NEW for 2018: Increased from 6′ x 8′ to 6′ x 9′ Flat Deck Area). Big and beefy and ready for action, the Folding Stand-Up™ Utility Trailer works as both a powersports trailer for your ATVs, UTVs, and Side x Sides, and as a general-purpose utility trailer with its large 6 ft. x 9 ft. expanded metal deck. And in true Kendon style, it folds up and stands up for amazing space-saving convenience. The Utility has a 2,000-lbs.-rated axle and heavy-duty expanded metal deck. Big, strong, and useful. The Utility folds up and stands up and has a footprint barely larger than a large bedroom dresser. Convenient, manageable, and helpful. Exceptional performance doesn’t just happen by accident, it’s a product of superior design and years of testing and refinement. Kendon’s round steel tube construction and triangulated frame geometry is inspired by race-car design and engineering. The result is a trailer that is incredibly easy to use and even easier to tow. Our years of testing and refining our frame geometry helped us develop an amazingly lightweight, incredibly strong trailer. That means a great ride for your bike or cargo and an easy tow for your vehicle. And for you that means a trailer that’s easy to stand up and maneuver in the garage. Whether your towing your favorite toys or doing hard work, the Kendon Folding Stand-Up™ Utility Trailers get it done. The fold-flat 6 ft. x 9 ft. heavy-duty expanded metal deck is strong enough and large enough to carry your ATVs, UTVs, SXSs, golf carts, appliances, wood, building materials, or just about any other cargo you need to haul. Best of all, the Utility trailer take up so little space in the garage you’ll forget all about it – until you need it again. Fully customize your trailer the way you want it at NO extra cost. ** Select from a range of color options and four alloy wheel styles. Can’t choose just one color? Choose two! You can select a one or two-tone color option to make your trailer stand out from the crowd. Add accessories to your trailer for a complete towing package. From tie-downs to spare tires to jack stands. A range of accessory options is available to enhance the functionality of your Kendon trailer. Also available is a full line of replacement parts. Should something go wrong, Kendon has you covered. 1.) Manufacturer’s Suggested Retail Price (MSRP) excludes destination freight charges, tax, title, license, handling, dealer fees and optional equipment. 2.) Maximum Length refers to the unfolded/open trailer length measured from the front of the coupler to the back of the rear folding section. 3.) Max bike measurement is measured from the front of the motorcycle’s front tire to the center of the rear axle. 4.) 5-Spoke Aluminum Wheel with Radial Tire upgrade is available for all Kendon trailers. 5.) Hitch Height refers to the standard hitch height, which may vary with vehicle, trailer, and load. Trailer should be level in tow. Check carefully before towing. 6.) Due to the vast number of different vehicles, trailer applications, capabilities and functions may vary. Please contact Kendon with your specific application to ensure the product fits your needs. Photos shown are representational photos only. Kendon reserves the right to technical changes and model changes. Models shown equipped with standard equipment only. Optional equipment not included. Accessories are optional. This Site and all the information it contains is provided for information purposes only on an “as is” basis and could include technical, typographical or other errors. In certain areas, the information provided may represent an opinion or judgment. Kendon, information providers and their agents make no warranties, representations, or guarantees of any kind, express or implied, including but not limited to, accuracy, currency, or completeness, the operation of the Site, the information, materials, content, availability, and products. To the extent permitted by applicable law, Kendon disclaims all warranties, expressed or implied, including but not limited to, implied warranties of merchantability and fitness for a particular purpose. *Free freight to contiguous 48 USA states via standard LTL ground freight with delivery to a residence (liftgate included), local freight terminal or business only (must specify if business has forklift access or requires liftgate). Home delivery may not be available/not guaranteed to all locations. Home deliveries, where possible, are curb-side-only; inside delivery or additional requests may incurr additional charges. **Additional cost may apply to non-standard and custom colors. Kendon does not guarantee 100% color match on/to vehicles. All products are shipped FOB (Freight On Board) Placentia, California. Kendon does not guarantee shipping and/or transit times. Customer is responsible for any additional freight charges. Residential deliveries, where possible, are curb-side-only. Due to the large size and height of Kendon trailers, Kendon cannot guarantee that a trailer can be shipped and delivered to all business and residential locations throughout the United States. 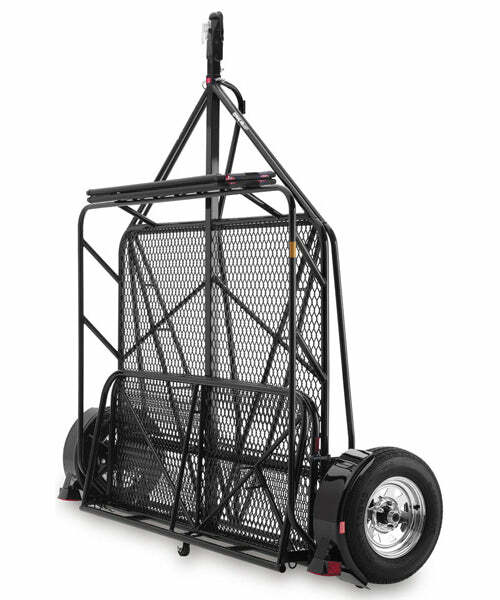 Due to equipment and area limitations, residential deliveries with a lift gate cannot be guaranteed to all locations. If unsure, please contact Kendon for a freight quote and to verify that a trailer can be delivered to your location. Kendon does not accept returns without an RGA (Return Goods Authorization) number. Customer is responsible for return freight. Returns may be subject to 20% restocking fee.